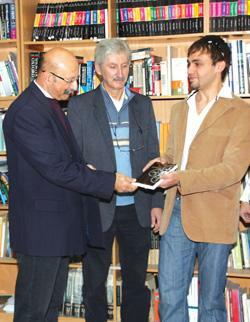 Steven Camilleri (right) presenting the novel to Marcel Xuereb. Also seen is Pierre Buttigieg (centre). Steven Camilleri recently presented a copy of his novel The Key to Revival? to Sir M.A. Refalo Centre for Further Studies library in Victoria. The presentation was made to the head of school Marcel Xuereb in the presence of students and librarian Pierre Buttigieg. During a short address Mr Camilleri said: “Learn to live your dreams in an infinite field – failure to do so will only drive a given soul into deprivation”.